In this class of proposed concepts the purpose is to integrate nuclear reactor, electric propulsion and superconductivity technologies in a single engine. Except solid-core NTR, all nuclear engines must necessarily reject a large fraction of the heat generated (in Rubbia's engine this is almost 50%; in other NEP concepts this fraction is even higher). NTR "reject" most of the heat to the propellant, so a radiator is not needed at all. Figure 7.31. 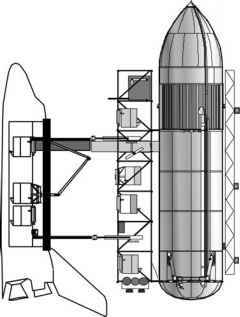 Generic hybrid nuclear thermal and nuclear electric rocket (parallel system shown). shrink the size of space radiators, which are massive components in nuclear propulsion. Examples of this strategy start with the "bimodal" NTR proposed in [Borowski et al., 1999], later expanded to "trimodal" to include also chemical propulsion [Joyner et al., 2004]; the "indirect" nuclear propulsion system of [Chew et al., 2004], in which a nuclear reactor heats the propellant via a heat exchanger, uncoupling the power core from the propulsion systems; and the hybrid NTR/NEP described in [Powell et al., 2004], where the waste heat of a MITEE engine (see Section 7.14) is converted to electric power feeding a conventional electric thruster. The more straightforward of such proposals would be to use waste heat simply accelerate the expanded exhaust of a NTR, similarly to what done by afterburners in jet engines. On the positive side, hybrids may have decisive advantages. NTR have typically large thrust and low Isp, while electric thrusters feature just the opposite. In many missions the two different modes of propulsion may be present to power different segments of the trajectory. Then how to divide nuclear power between NTR and electric thruster becomes a paramount question: different missions may need different NEP to NTR power ratios. For instance, orbiting or deorbiting near planets may demand high thrust to save time: this is the case for crewed spacecrafts. For this class of missions the ideal propulsion system should be capable of large thrust at low Isp to reach escape speed quickly, followed by much smaller thrust but much higher Isp to keep accelerating, even at a modest rate, toward final destination. A hybrid NTR coupled with an electric thruster has such capability by design. Criteria and modes (i.e., tandem or parallel) of apportioning power between two very different propulsion systems have not been derived yet for interplanetary missions, and need to be addressed in the future. Historically, these questions were raised at the dawn of the jet engine age (early 1940s), when many airplane manufacturers were designing fighters with both jet and piston engines. From the efficiency viewpoint, among the many issues of tandem hybrids is that of ionization. Ionization, needed to enable electric thrusters to work, might absorb an excessive fraction of the waste heat recovered. Performance of each engine (NTR and electric) depends on temperature in roughly opposite ways: ionization of the NTR exhaust should be as low as possible to recover most of the thermal energy; to operate a ion or MPD accelerator, ionization should be as high as possible. A tandem NTR + MPD thruster will likely require seeding the exhaust from the NTR with low ionization potential metals, for instance K, Ba, or Li. In fact, lithium could be the propellant for the NTR engine, alone or mixed with hydrogen. This tandem hybrid concept looks promising in the case of Rubbia-type NTR. MPD acceleration of a Li plasma, with Isp = 3,000 s, has been demonstrated even when the plasma regime was collisional. Although MHD acceleration of H or H + Li exhaust has never been tested, it is interesting to estimate its effect on the nominal performance of the Rubbia's engine reported in [Augelli et al., 1999]. The efficiency of MPD acceleration 40-50%) should raise Isp by 100-200 s, with a simultaneous reduction of the space radiator mass. Assuming Isp = 2,500 s as baseline for the Rubbia's engine, the effect of recovering waste heat would be of order 4% to 8%.